OurAPPLIED IMAGE Imaging Gauge Test Charts are manufactured from the highest quality imaging materials available using our ACCUedge® technology. 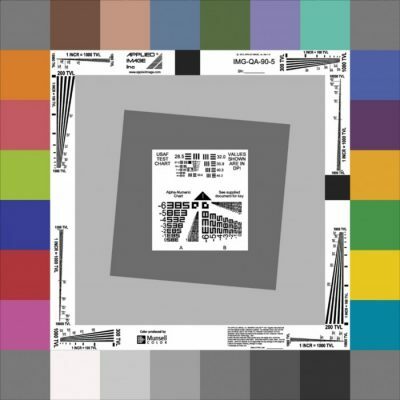 The Munsell colors used are of similar values as those used on the X-Rite, Inc. and Macbeth ColorChecker, and are calibrated using measuring instruments which are traceable to NIST (National Institute of Standards and Technology, USA). Imaging Gauge test charts incorporate both human-readable and machine-readable resolution features to enable the correlation of measurements to real-world images. All features are printed on high-quality materials for durability, consistency and accuracy. Available sizes: 1 ft, 2 ft. and 4ft. square.